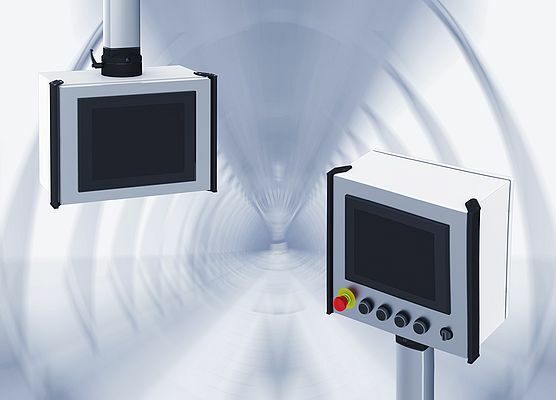 Lohmeier presents the new BAE and BAV lines of HMI enclosures which are tailored to the requirements of state-of-the-art panel IPCs and touchscreens. Designed for use with the CS-3000 support arm system, they can now also be combined with all other systems on the market thanks to standard-compliant universal machining. If required, they can replace older units in existing machines and plants. They can also be mounted to walls or directly attached to machine bodies. The enclosures feature new metal handles with an added benefit: thanks to their modern design, they ensure considerably improved handling. Just like the enclosures, they can be coated in any RAL color, with different colors possible for handles and enclosure. Thus, the units can be easily optically and technically adapted to the individual machine design or CI. Additionally, all visible screw heads on the front plate were replaced by invisible fixing elements on the inside.